These days, technology is evolving too swift – and so as business. With an increasing value for human resources, companies greatly rely on technology. Critical business positions are still being performed mainly with limited dependency on technology, while mechanical and clerical functions are being strongly aided by machines. Office set up is also designed to cut expenses without downgrading the quality of services they offer to their customers. There is no doubt that the value of time significantly increases as well. This only means that each player in the business industry is co-dependent with one another and an oversight to any of these factors would greatly affect the overall performance of the business. With all these factors to consider, getting the services from a third-party provider may be the most practical option for many businesses. Naturally, before getting into this practice, the company has to review their short-term and long-term needs and goals. Functions should be clearly defined among each employee. There should also be an open communication within the company to avoid barriers and misunderstanding. Third party providers are considered contributors to the organization since they share roles in achieving the mission of the company. They have the same direction and that is to achieve their client's target. The conservative approach such as exclusivity isn't the trend anymore and companies are getting more open-minded. In the evolving world of business, welcoming services from third party provider is a smart decision. It doesn't just save money; it also maximizes time especially with the use of technology. 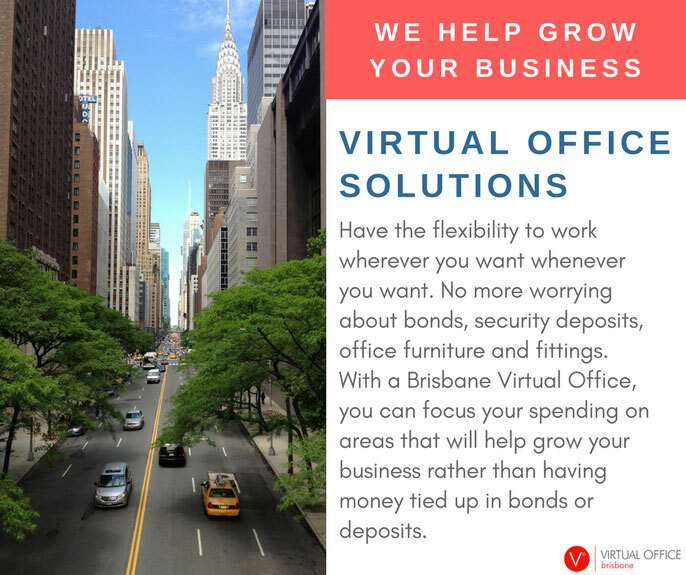 Hiring a Virtual Assistant in Brisbane is one of the most in demand, cost-effective, and functional services you can get from a third party provider. It started in the 1990s when the term "virtual" was used to describe the ability to work remotely through the help of technology advancements such as high-speed Internet connection and document sharing. This breakthrough has come a long way in the business industry and many companies are opening their doors due to its uncountable benefits. A Virtual Assistant is a person who works remotely and provides expertise and services for a client/company. The good news is that customers calling your business won't even notice that they are not physically present in the office. They are actually doing all of their work somewhere else, either in a call center facility or in the luxury of their own home. Most customers can even have the perception that the Virtual Assistant is just in the reception area, which is exactly the goal that every business wants to achieve. They fully represent the company with the basic knowledge about the products and services they offer, and of course, the company itself. A Virtual Assistant takes the role of an intermediary between the customers and the employees. It's a multi-functional position that can perform various services such as receiving inquiries, asking specific questions through the help of a script, as well as gathering basic and complex information that they shall pass on to the concerned member of your team. All these should comply with the general instructions from the client/ company. They can transfer detailed information the way the client wants their messages to be conveyed – by email, SMS, or call. Aside from answering queries and data gathering, some specialized Virtual Assistants can also perform more challenging functions such as research and data gathering. Other specialized functions include data encoding, social media management, web design, bookkeeping, marketing and public relations, research, writing, travel booking, and website management among others. They can also be your interactive planner who takes down meeting requests and other appointments. Basically, a Virtual Assistant can perform all of the functions of a Virtual Receptionist, but a Virtual Receptionist cannot perform all of the functions of a Virtual Assistant. Hiring a Virtual Receptionist in Brisbane would definitely give you the help that your business desperately needs, but not on the same level of help like a Virtual Assistant can provide. Virtual Assistants are mostly in demand for entrepreneurs and sole proprietors who need the help of an in-house assistant but don’t have enough facility and budget to take them into the office. Nowadays, even middle-sized and big businesses also get the services of a Virtual Assistant; surely not because they cannot afford to hire an in-house assistant, but because of the professional image it can provide to your company. With this, this service becomes more useful, practical, and cost-effective. Virtual Assistants are highly trained and considered experts in various specialized functions. Whether it's a single function requiring a specific skill set or a multi-functional position that may require various knowledge of different tasks, the outcome of their services is mostly positive based on the history and studies conducted regarding their service. No wonder, the demand for Virtual Assistants increase as businesses get to know more about its benefits and the money they can save from getting one. 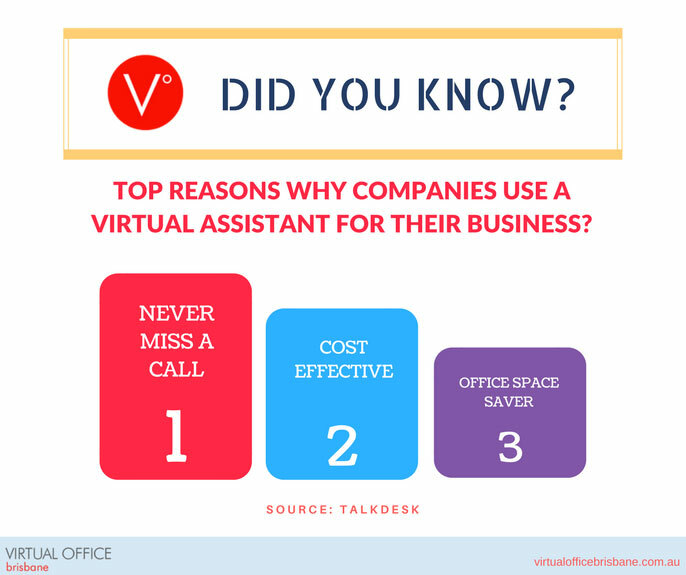 Why Use a Virtual Assistant for Your Business? 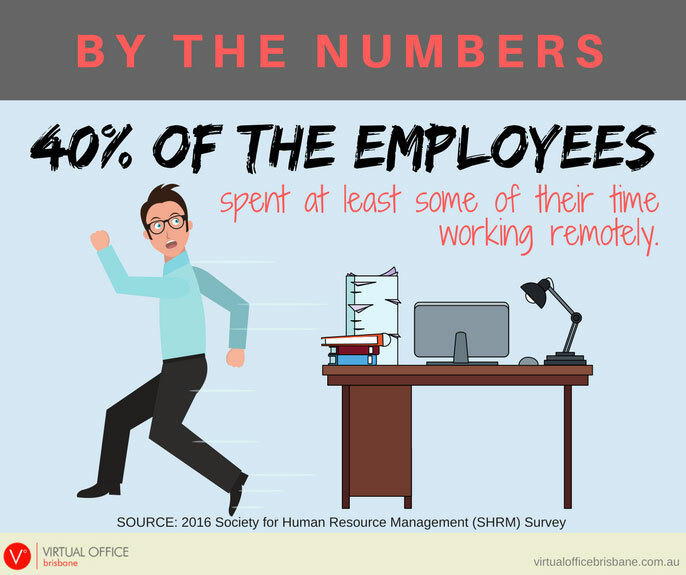 According to the 2016 Society for Human Resource Management (SHRM) survey, 40% of the employees spent at least some of their time working remotely. This is highly related to the increasing demand of remote employees or Virtual Assistants all over the world. For instance, hiring a Virtual Assistant is no longer limited by geography and employers can scout talents from the best, yet cost-effective companies that offer Virtual Assistant services. Moreover, further studies have proven that outsourcing some positions to a third party can be more productive compared to hiring an office staff. Based on a study, call center employees are more productive than their in-house staff counterparts. With the primary purpose of getting the job done, they tend to take fewer breaks, leaves, and focus only on accomplishing their jobs. In a regular office set up, employees have the tendency to get distracted by several factors such as answering phones, assisting a colleague doing other task, accepting too many deadlines, or in some cases, they’re just simply not motivated to work. When you hire a Virtual Assistant, you eliminate the aspect of job dissatisfaction and poor performance from your in-house physical assistant. Your employees can now focus on more important tasks that would produce greater benefits for the company. Without worrying that there will be an unexpected task that will be asked from them to do (probably something that is outside of their job scope), they can freely do their job based on their own style and definitely without rushing just to accommodate other requests, which would produce a better quality of accomplishments. Hiring a Virtual Assistant is a win-win situation for everyone, both for the company and their staff. Convenience is the primary advantage of getting the services of a Virtual Assistant. They can take calls efficiently and professionally and are viewed experts in this field. The secondary advantage with almost equal importance is money. The company will only be paying them specifically for the services they provide, i.e., the number of calls they take for the agreed period or the exact number of minutes that calls are taken. No more budget allotment for office equipment and furniture, salary, and training. Aside from the huge difference between the expenses of an in-house assistant versus that of the Virtual Assistant, the company is not mandated to pay for the bonuses of the Virtual Assistant. The amount of the monthly fee is the only thing that you need to pay to your virtual staff – no more, no less. Through the help of a Virtual Assistant, the company, whether it's big or small, can focus on its core functions. They don't have to worry about customer service and other clerical functions because the Virtual Assistant service provider can perform them as exactly as you’ve instructed them. No opportunities will be missed since there's a hand that focuses on these specific functions. For companies without receptionist and assistants, employees including those with higher ranks may miss important calls as their time is divided into so many functions and answering phone calls is just the least of their concern. Aside from the missed opportunities, it can also have a negative impact on the company due to poor customer service. Virtual Assistants can also take calls 24/7. In order for you to realistically do this in-house, you must have at least 3 assistants that will be shifting schedules every 8 to 9 hours. With or without anyone calling your business in the wee hours, you are required to pay them their daily rate, including night shift allowance. By now, the expense has grown exponentially, which makes this option borderline crazy to even consider it. 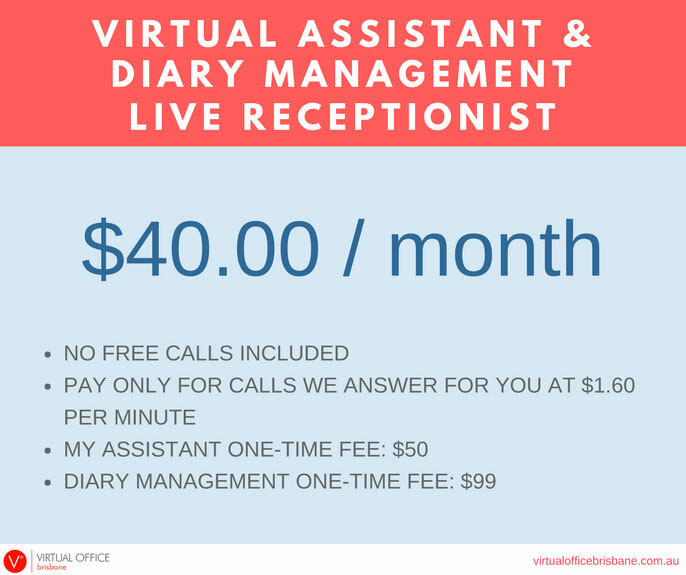 How Much Does it Cost to Hire a Virtual Assistant in Brisbane? In getting the services of a Virtual Assistant, the fee is time-based. The standard plan with no included calls is only $40 per month. On top of that is the payment for answered calls that cost $1.60 per minute. You are sure that there is value for your money since payment is made only for answered calls. Hence, this means that you know where your money is going. If there are few calls for the day, then you also have to pay for a lower rate and the other way around during peak seasons. An in-house assistant receives a salary of roughly $4,000 for 20-22 working days in a month. 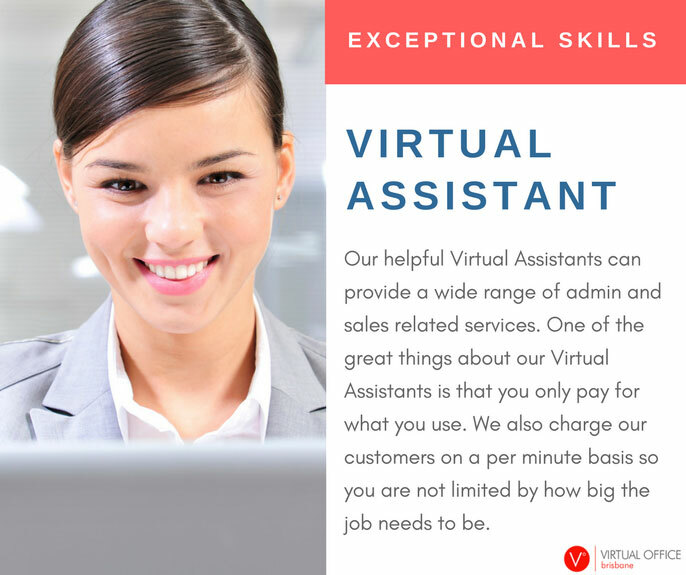 The monthly fee for a Virtual Assistant is only a fraction of the cost you spend when hiring an in-house assistant, not yet counting the bonuses and other expenses in arranging the workplace, training, etc. The daily rate of an in-house assistant includes the times when the employee is not doing the functions or even if there are no calls received or minimal job to do in a day. Unlike with the Virtual Assistant, the total fee varies with the services rendered. You can imagine that within a single call, assuming that your Virtual Assistant has helped you close a deal during the first day of the month, then you have already recovered the cost of the fee. And without any doubt, your Virtual Assistant shall continue doing this for the next 29 days of the month 24/7 – while you and the rest of your team are sleeping comfortably. Is it Better to Hire a Virtual Assistant than a Traditional In-House Assistant? In comparison to hiring a traditional in-house assistant, it is a lot easier and more beneficial for the company in terms of time, energy, and money. If you will hire a regular admin position, you have to start from the basic part, which is the screening of applicants. Of course, you would want to hire the best from a pool of candidates. After getting the best fit for the position, you have to train the employee. Extensive training is a must for this kind of position since it is the gateway to prospective clients and business opportunities to your company. As the trainer, you will invest time, money, and effort. If everything goes well, you have to prepare for the office space and other machinery, which are all requirements for the position. If the employee fails the training, then you have to start the screening and the training all over again. In terms of expertise, Virtual Assistants are better trained to handle telephone answering services than anyone that you can potentially hire in-house. You don't need to think about the training and the learning curve. All you have to do is prepare the list of functions and details they need to know in dealing with your customers. • First, you’re assured that the service being provided by a Virtual Assistant will be delivered in a professional manner. They are proven to be well trained and experienced in various fields. This is backed by studies and research. Just a reminder, only choose a reliable company that provides virtual assistance. • Second, it is cost-effective. Expenses are lessened by more than 80%, where you only need to pay the monthly cost as compared to hiring a traditional in-house assistant. • Third, you’re maintaining a good working environment for your team. It guarantees that you avoid destroying the morale of your staff by avoiding giving them extra tasks. You can have higher expectations that they can be an effective part of your business, while you let your Virtual Assistant do the telephone answering services for your business at a different location. •Fourth, the opportunity to expand your company outside of your primary business operation. If you want to operate your business in Brisbane, London, New York, or anywhere else in the world, hiring a Virtual Assistant could be a great start to test the waters. These days, business is changing and you need effective strategies to keep up with the competition. Moreover, technology is evolving too fast and it has beneficially come in handy with smart business solutions. Virtual Assistant and Virtual Receptionist services have been some of the most effective breakthroughs in the field of business technology. The best part is, you get the best services without the need to spend more, compared to hiring a traditional in-house assistant. You earn more and spend less. The excellence of this service can lead to increase sales conversion and a distinct name in the industry. If you’re looking for a telephone answering service provider in Brisbane, sign up now!